The Evans Heavyweight Coated is an extremely thick 2-ply snare drum head, perfect for heavy hitting and loud volume drumming. The addition of a control dot adds even more durability, and gives more focus and attack when struck in the center. The Evans Heavyweight Coated is an extremely thick snare drum head, made with two plies of 10mil film and a top coated layer. The added 3mil underside center control dot brings the total center thickness of this drumhead to a very thick 23mil. The Evans Heavyweight can produce a big snare drum sound, and is designed to be hit hard. 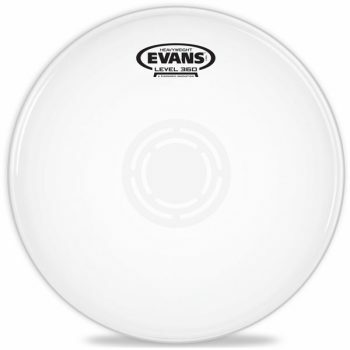 Sound-wise, the Evans Heavyweight Coated is a very focused snare drum head. This drumhead will give a short sustain when tuned higher, however the very thick construction and control dot means overtones will never ring out of control. 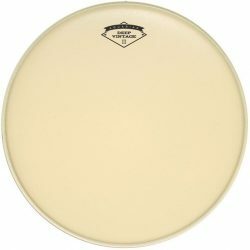 When tuned low, this drumhead will give a nice fat thud with minimal sustain. The Evans Heavyweight is a snare drum head with a strong attack, and a cutting crack that will be heard in loud environments. The center dot helps to increase this attack. The Heavyweight’s overall tone is quite deep and warm, although it becomes more cutting when tuned up higher. 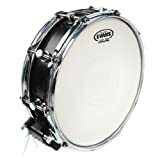 The Evans Heavyweight Coated is designed to withstand extremely hard hitting, and is perfect for huge rimshots that cut through in a loud environment. The very thick construction means that the Heavyweight can take a beating (hence the name, thanks Evans). If you’re constantly damaging snare drum heads, the Heavyweight is worth buying for your kit. 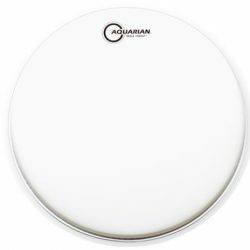 Note that if you play a lot of light ghost notes and soft touches, this may not be the right drumhead for you… At low volumes and softer playing, the Evans Heavyweight’s thick design is not very responsive (especially when tuned low or medium). 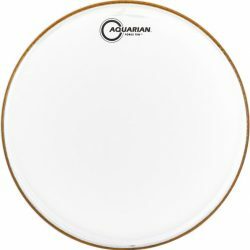 This is a drumhead designed to be played hard and loud. 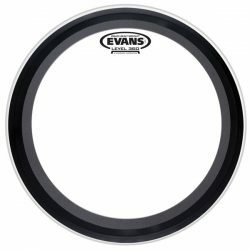 The Evans Heavyweight is a great high volume drumhead, providing excellent durability and a big sound. While this drumhead is best suited to drumstick use, the coated surface is also responsive to brushes. The control dot is placed on the underside to allow smooth brush playing, and the Heavyweight gives a very focused brush sound thanks to the thick design. 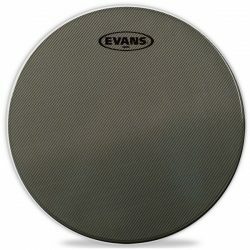 The Evans Heavyweight Coated is designed for snare drums, and comes in 12″, 13″, and 14″ sizes.